Although I'm still working on the squares for this patchwork blanket, I needed a break from that for a few days and decided to attempt a project on circular needles. I have been summoning the courage to try circular needles since I really want to make each of the kids a hat for Christmas. I already made Elizabeth a scarf for Christmas out of the yarn below so I thought I'd start with a hat for her. I'll likely have to visit my local yarn store to figure out how to finish the hat, but I love how it's working up so far. Elizabeth saw a poster of fruit "friends" so her crafting has revolved around making a set of her own. 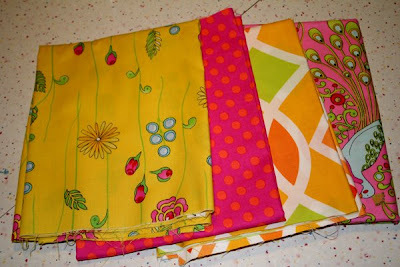 Next up I plan to make Elizabeth a summery tiered skirt out of these "sherbet"-colored fabrics that I purchased at a local shop. I have been wanting to visit since they opened, and since I regularly see their wares on Melissa's blog, and I finally got the chance. Mmmm...good stuff there. 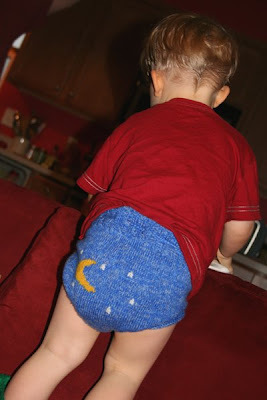 Where I really want to go with my newly emerging knitting skills...to projects like this diaper cover. Sigh...this will hopefully be Finn's last summer in wooly bottoms, and I'm enjoying every minute. I'd love to be able to make ones like these for friends' kiddos once my skills improve. Love the fruity friend and wooly bottom! If you want to air out and wash that wool for me I have just the bottom to fit it (I'm afraid of wool covers!) I LOVE your fabric choices-- that's my fave line. I did a reversible wrap in the peacocks and pink flowers-- so, so beautiful. Elizabeth will glow in those colors! I LOVE the yarn for that hat!!! Aww, the little moon and stars cover is adorable! 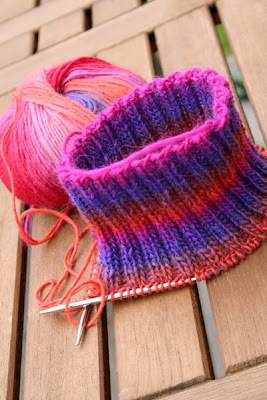 I love the yarn that you are working with, so pretty and the fabric is beautiful! The fruity friend is so much fun! What a cute little wooly bottom! 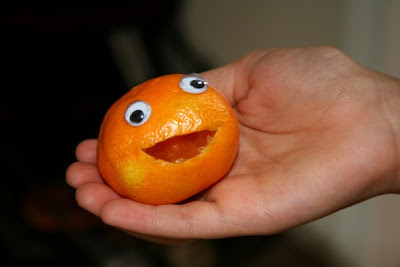 I love the cute fruit friend!